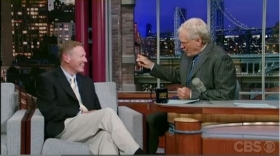 Ford CEO Alan Mulally and David Letterman talked about Ford's electric car plans. David Letterman’s professed passion for cars may not be on a par with that of his former late-night TV rival, Jay Leno. But Letterman, whose final “Late Show” airs Wednesday night, is quite a car buff, keeping his collection hidden away, a CBS spokesman says. And Letterman -- whose Top Ten List is a nightly segment -- featured plenty of automotive follies during his 22 seasons as host of the CBS show. In honor of his farewell show, we count down his top 10 automotive moments. 10. Dave goes on a fast-food car trip with Zsa Zsa Gabor. Letterman drives around Los Angeles stuffing the actress with fast food. Inevitable hilarity ensues. 9. Dave talks to Bob Lutz about the Chevrolet Volt. Lutz tells Letterman all about the Volt in 2009, when the prototype of the plug-in hybrid was produced. 8. Dave might be letting his 10-year-old son drive. 7. Dave pokes fun at Tesla and self-driving cars. Letterman shows what happens when he takes his foot off the accelerator and lets go of the steering wheel. Highlight: Audience silence when Letterman admits to driving an electric car. 6. Dave uses a car phone. In this moment in technological history, Letterman makes prank calls from his car phone. Highlight: Every interaction with the WINS-AM traffic team. 5. Dave, with Alan Mulally, drives Ford’s first all-electric vehicle across the “Late Night” stage. Ford’s CEO tells Letterman about the company’s all-electric Focus, and they go for a quick spin. Honorable mention: Ever-cautious, Letterman is sure to use his turn signal when turning out onto the stage. 4. Dave test drives a motorized cupcake car. Forget about EVs, Letterman takes a $25,000 motorized cupcake for a drive. Honorable mention: Around 1:32, Letterman intentionally smashes into a Christmas tree. 3. Dave destroys a car with bowling balls. A lucky contestant in Bob Borden’s Bowling Ball Demo destroys Borden’s broken-down 1991 Mazda MX-6 by tossing bowling balls off the roof. 2. Dave brings out an Akio Toyoda impersonator to apologize for unintended acceleration. The impersonator of Toyota’s president wants to apologize to America for the recall of millions of Toyota vehicles in 2010. 1. Dave has fun with a car. The hands-down winner is Letterman’s afternoon of high jinks with a 1972 Buick Centurion convertible in this 1995 sketch. Letterman rides the lift at the garage, chugs motor oil and fills his convertible with Taco Bell tacos. What more could you want?